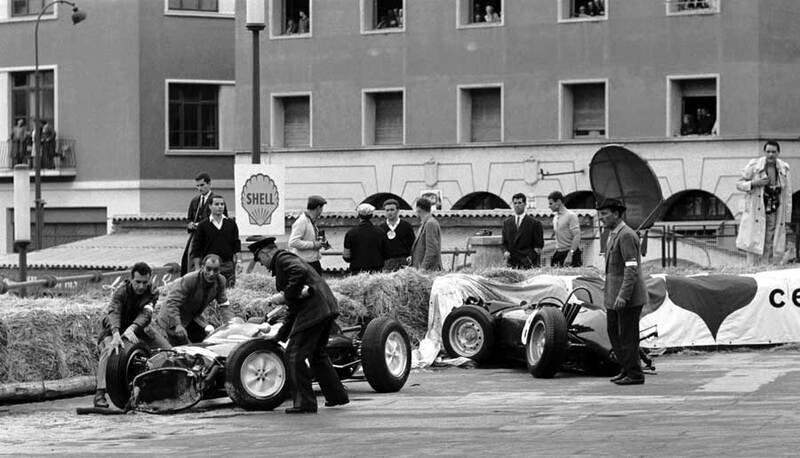 BRM reliability problems cost Graham Hill victory at the Monaco Grand Prix, as his engine blew up just seven laps from the end, allowing Bruce McLaren to come through and win in the new works Cooper Climax. British cars once again dominated practice and took the first three places on the grid, with Jim Clark on pole in the new Lotus 25. A dramatic start saw a pile up at the first hairpin bend, when Richie Ginther's BRM ploughed into the back of Maurice Trintignant's Lotus. Dan Gurney, Trevor Taylor and Innes Ireland were also involved and tragically, a marshal was killed by a flying wheel from Ginther's car. The drivers all escaped without injury. Clark had made a poor start and found himself chasing after McLaren and Graham Hill, who had sped off into the lead. For lap after lap Clark duelled with McLaren and eventually, on the 27th lap overtook. He now started to narrow the gap on Hill, gaining on each lap until they were only seconds apart. But on the 56th lap Clark's clutch went and Hill was left out on his own in the lead. Hill, who was to win at Monaco five times, looked as if he had the race sewn up, but seven laps from the end his engine gave up the ghost. McLaren took over the lead and fought off a determined challenge from Phil Hill in his Ferrari. The gap between them decreased from over 15 seconds to less than two, and the crowd were on their feet as the green and red cars flew along the finishing straight, barely a car's length between them. Over a minute behind in third came new Ferrari driver Lorenzo Bandini, and everyone else was lapped, headed by John Surtees, who was fourth in the Lola. Graham and Phil Hill were now joint leaders in the world championship with 10 points, one ahead of Bruce McLaren.